On December 22, 2017, President Trump signed into law the Tax Cuts and Jobs Act of 2017 (P.L. 115-97). The Act represents the most sweeping tax policy legislation in 30 years and will affect nearly every individual, married couple, business owner, and corporate taxpayer in the United States, regardless of their tax liability and whether or not they are filing jointly vs. single filers. 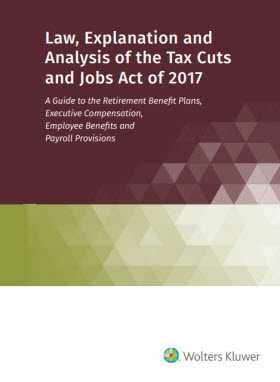 Law, Explanation and Analysis of the Tax Cuts and Jobs Act of 2017: A Guide to the Retirement Benefit Plans, Executive Compensation, Employee Benefits and Payroll Provisions is out in front with expert analysis of the practical effects this law will have on retirement benefit plans, investment, executive compensation, employee benefits and payroll. And radically changes the standard deduction and personal exemptions allowed under pre-2018 law. Only Law, Explanation and Analysis of the Tax Cuts and Jobs Act of 2017: A Guide to the Retirement Benefit Plans, Executive Compensation, Employee Benefits and Payroll Provisions highlights the immediate impact of key changes, delivering practical guidance you can put into effect today.